Man does not live by Italian bread alone. I’ve loved corn muffins for most of my adult life. When I was a teenager, my friends and I would stop at the neighborhood candy store, BonBons, for a buttered corn muffin and chocolate egg cream. BonBons was on 77 Street and New Utrecht Avenue, right under the El. The El was the elevated railroad that the B train ran on from Coney Island to Manhattan. Those were some of the best corn muffins I ever had. They were mildly sweet, moist and delicious. Slab on a little butter and wash it all down with an egg cream. I could taste it now. Eddie, the owner of BonBons used to always have a half-dozen of those corn muffins under the cake stand he had on top of his counter. There was never any need to toast them either because they were always fresh and moist. I wish I knew where he got them from. 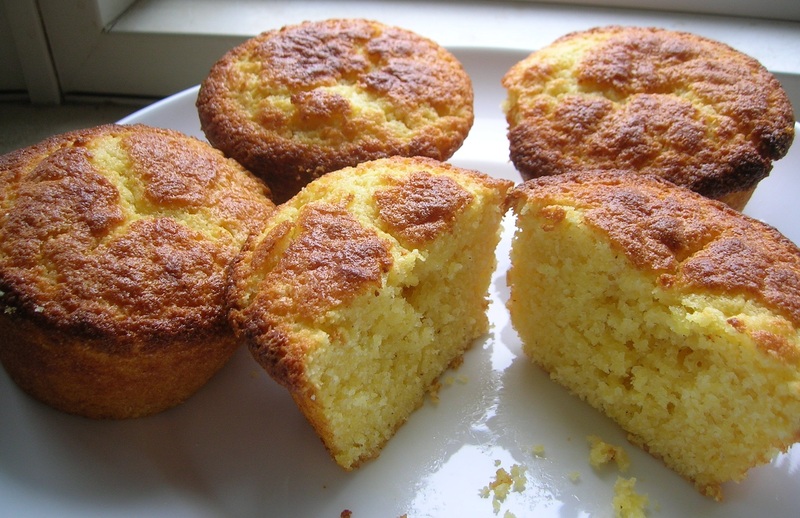 I tried duplicating the taste and texture of those corn muffins over the years. After much trial and error I came up with a corn muffin as good if not better than the ones I used to get at BonBons. One ingredient I use that really adds to the flavor is Vanilla Kefir Cultured Milk. One of the brands they sell at my local store is Lifeway Lowfat Kefir Cultured Milk Smoothie, Vanilla flavor. It’s essential for the flavor and moist texture of these muffins. It takes only about 15 minutes to whip up and another 20 minutes to bake. In a large mixing bowl combine the corn meal, flour, sugar, baking powder, and salt. Mix well. Add the butter by cutting it into small pieces. The best way to incorporate the butter into the flour is by hand. With one hand, mix and squeeze the flour and butter together until the butter is totally incorporated into all of the flour and you do not have any whole pieces of butter left. In a smaller mixing bowl beat the egg well. Add the milk and Kefir to the beaten egg and mix well. Add the milk and egg mixture to the dry ingredients and stir to combine. Do not over mix, just be sure that all the flour is moistened. It will look like a very thick pancake batter. Fill your greased muffin tin 3/4 of the way to the top with the batter. Place in the oven for 20 minutes. The muffins are done when you stick a toothpick into the center and it comes out clean. This entry was posted in Dessert and tagged corn muffins. Bookmark the permalink. Great to have you continue your blog … great reading and good food!